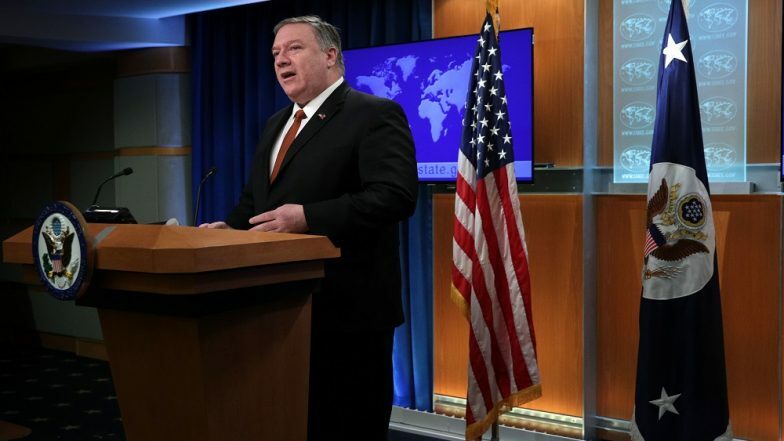 Washington, March 28: US Secretary of State Mike Pompeo Wednesday chided China's "shameful hypocrisy" over its treatment of Muslims in the Communist nation while protecting violent Islamic terrorist groups from sanctions by the United Nations. Pompeo was apparently referring to China blocking a proposal to designate Pakistan-based Jaish-e-Mohammed's chief Masood Azhar as a 'global terrorist' at the UN Security Council earlier this month. "The world cannot afford China's shameful hypocrisy toward Muslims. On one hand, China abuses more than a million Muslims at home, but on the other it protects violent Islamic terrorist groups from sanctions at the UN," Pompeo said in a tweet, without mentioning the JeM or the outfit's chief. China Blocks Ban on Masood Azhar, Defends Jaish-e-Mohammed Chief For 4th Consecutive Time. The world cannot afford China’s shameful hypocrisy toward Muslims. On one hand, China abuses more than a million Muslims at home, but on the other it protects violent Islamic terrorist groups from sanctions at the UN. France, along with Britain and France had moved a proposal in the 1267 Al Qaeda Sanctions Committee of the Security Council this month to designate Azhar a "global terrorist" following the February 14 Pulwama attack, but China, another veto wielding permanent member, blocked it. China put a hold on the resolution arguing that it needs more time to study it. Every member of the UN Security Council, except China, had supported the proposal. The JeM had claimed responsibility for the Pulwama attack in which 40 CRPF personnel were killed. Pompeo's criticism of China came on a day when it emerged that the US, supported by France and the UK, has directly moved a draft resolution in the UN Security Council to blacklist Azhar. Pompeo made the statement soon after he met a former prisoner and relatives who recounted abuses as part of Beijing's widespread detention of its Uighur minority in resource-rich Xinjiang. China, Pompeo alleged, has detained more than one million Uighurs, ethnic Kazakhs, and other Muslim minorities in internment camps in Xinjiang since April 2017. "The US stands with them and their family members. China must release all those arbitrarily detained and end its repression," he said. On Wednesday, Pompeo met with survivors and family members of China's "campaign of repression and mass detention" against the minority groups in Xinjiang. "I call on China to end these counterproductive policies and release all arbitrarily detained," he said.